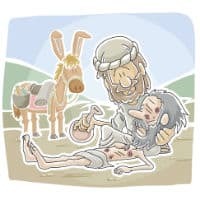 A well-known story of the Good Samaritan is always a good one to teach your class. Since it discusses loving your neighbor, it would be a good lesson to teach during the Valentine holiday. So I have put together this skit to help with teaching this most valuable lesson to your students. This skit is a great way to put your students “in the action” of the story and to “see” what the story is all about. Have fun with it and enjoy teaching your kids! Narrator – A lawyer stood up and put Jesus to the test. Lawyer – Teacher, what shall I do to inherit eternal life? Jesus – What is written in the Law? How does it read to you? Lawyer – You shall love the Lord your God with all your heart, and with all your soul, and with all your strength, and with all your mind; and your neighbor as yourself. Jesus – You have answered correctly; do this and you will live. Lawyer – And who is my neighbor? Jesus – (to the Lawyer) A man was going down from Jerusalem to Jericho, and fell among robbers, and they stripped him and beat him, and went away leaving him half dead. Jesus – On the next day he took out two denarii and gave them to the innkeeper. Samaritan – Take care of him; and whatever more you spend, when I return I will repay you. Jesus – Which of these three do you think proved to be a neighbor to the man who fell into the robbers’ hands? Lawyer – The one who showed mercy toward him. Jesus – Go and do the same. We used this skit last Sunday for SS for Grades 2 & 3! 15 students wrote their names on paper and we drew names for characters randomly. A church elder was Jesus. The kids performed the skit and it was fantastic! They were so into it, they asked to do it a second time…we did this and followed it with a discussion as kids sat at Jesus feet of real life situations they face and how they would respond. Jesus even shared about putting the Ephesians armor on each morning to help kids respond like the Good Samaritan! Thank you so much for this! Nice job! I’ll flesh it out a little more and have our Confirmation class act it out and video it on a cell phone. Thank you! Tony Kummer (Editor) reviewed & updated this page on : January 22, 2015 at 9:24 am. All our content is peer reviewed by our readers, simply leave a comment on any post suggest an update.